When the widowed Lena Schwab opened a pharmacy in the 1920s to support herself and her four sons and two daughters, little did she know she had put in motion the early beginnings of a legend. All six of her children worked at the pharmacy, but it was Jack Schwab who found the Schwab's Pharmacy on Sunset Boulevard, and after Jack's death, his brother Leon took it over Leon understood the unique potential of a pharmacy nestled among the Hollywood studios, and from the first morning swabs open its doors and its counter for breakfast at 7 AM, it became the haven to hang out and the home away from home for the best and brightest of Hollywood's honchos as well as hopefulness. 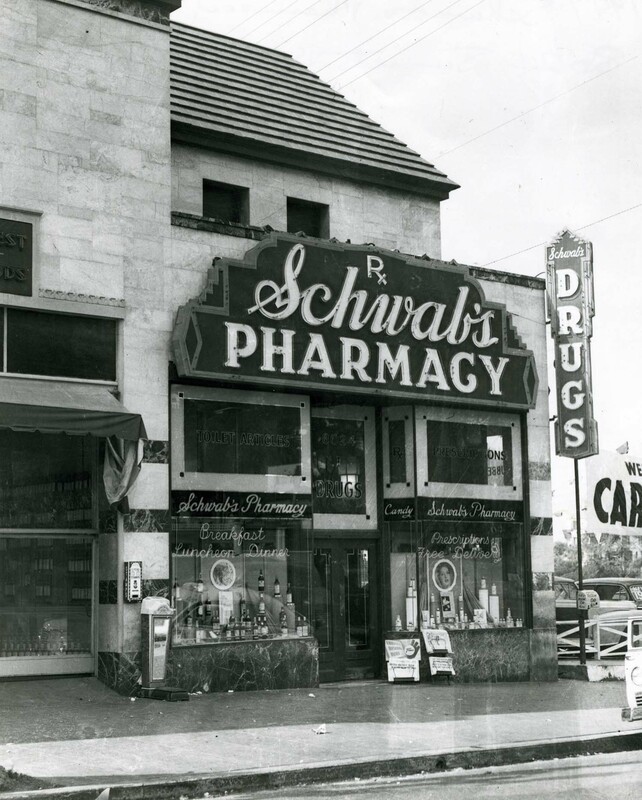 Schwab's Pharmacy was opened in the 1930's on Sunset Blvd. at Crescent Heights Ave. Shortly thereafter, the pharmacy became a popular place for many celebrities to purchase their daily theatrical newspapers, Variety and the Hollywood Reporter. Schwab's Pharmacy sold newspapers, magazines, various sundries and, of course, prescribitions. In addition, the "eating counter", was popular with neighborhood residents, as well as, hundreds of movie stars. After more than fifity years of being the most popular "drug store", it went out of business in the early 1980's. 1947 The front of Schwab's Pharmacy on Sunset Blvd. 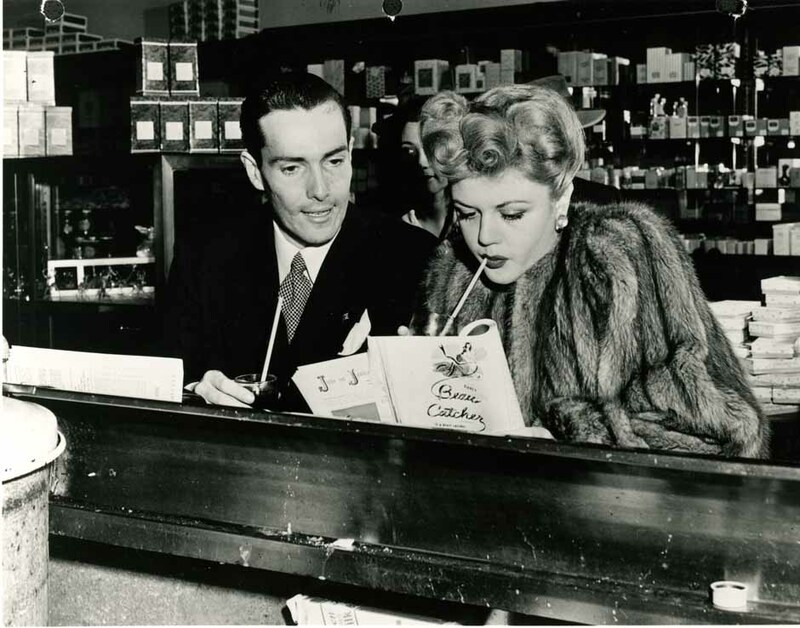 1945 Actress, Angela Landsbury and Hurd Hatfield share a soda at Schwab's lunch counter. The largest collection of vintage Schwab’s Pharmacy photos is on the hollywoodphotographs.com website. Schwab's Pharmacy opened at 8024 Sunset Boulevard in 1932, and was run by brothers Bernard, Leon, Jack and Martin Schwab. They had purchased a failing drugstore and decided to capitalize on the local business from nearby studios, like Republic, RKO, and Columbia. The first Schwab's was located downtown on 6th. 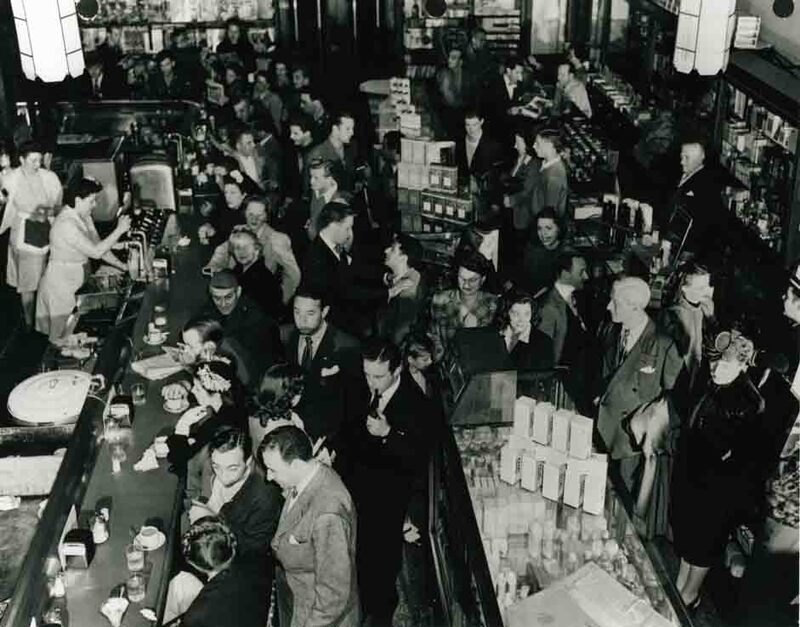 It was a typical drugstore of its time--goods and sundries available for purchase, prescriptions filled, and a soda fountain with counter service--only it happened to be in the heart of Hollywood. Schwab's Pharmacy was, arguably, the most famous drugstore in the country. It was the hangout of some of Hollywood's most famous celebrities and civic leaders. It all started, in 1932, when four brothers named Jack, Leon, Bernard, and Martin Schwab purchased an ailing drugstore at 8024 Sunset Blvd. in the heart of what is now West Hollywood. Schwab's Pharmacy opened at 8024 Sunset Boulevard in 1932, and was run by brothers Bernard, Leon, Jack and Martin Schwab. They had purchased a failing drug store and decided to capitalize on the local business from nearby studios, like Paramount, RKO, and Columbia. Not all icons last forever! I wish they did, but they don’t. One of Hollywood establishments, that is as close to an American icon was Schwab’s Pharmacy. Started in Hollywood in 1932, Schwab’s became an immediate success with, not only, movie stars , but also local residents. Located at the corner of Sunset Blvd. & Crescent Heights Ave., Schwab’s most popular attractions was its lunch counter. It was not unusual to see several celebrities having lunch or dinner at the stool lined counter. One of the largest collections of Schwab’s Pharmacy photographs is hollywoodphotographs.com. Photographs of the Famous Schwab’s Pharmacy are quite rare but you can see scores of them at hollywoodphotographs.com.